Violence again roiled St. Louis on Saturday night as protests over the acquittal of a white former police officer in the killing of a black man ended with a group of demonstrators breaking windows and throwing objects at police. Officials said at least nine arrests were made and 11 officers were injured over the course of two days of unrest. Singer Ed Sheeran and rock band U2 canceled concerts planned for the city this weekend. On Friday, 11 officers were injured and 33 people were arrested after the first wave of protests turned violent following a judge’s verdict finding former officer Jason Stockley not guilty of first-degree murder in the 2011 shooting death of Anthony Lamar Smith following a car chase. Saturday afternoon, demonstrators marched and held a demonstration in West County Center mall, holding signs reading "Black Lives Matter" and "Murder Is Illegal." Marchers moved on to the nearby Chesterfield mall and the Taste of St. Louis, NBC affiliate KSDK reported. In the evening, a large and peaceful march took place in University City and later disbanded. A smaller group then gathered in the Delmar Loop area, known for its concert venues, restaurants, shops and bars, according to the Associated Press. 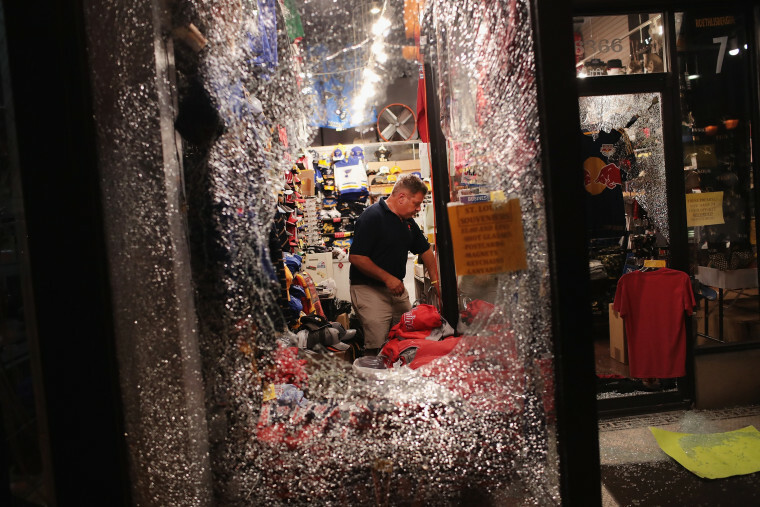 Officials declared it an unlawful assembly but the group refused to disperse, breaking windows at dozens of businesses and throwing what officials called "debris" at police. Missouri Gov. Eric Greitens said earlier Saturday that police are dedicated to protecting peaceful protesters, but "violence and vandalism is not protest, it is a crime." David Kaslow, who owns the Meshuggah Café in the area, said he thought the protests had dispersed when he received a call from his landlord to say the cafe's windows had been broken. "It's heartbreaking," he said. "My wife runs the cafe and she works hard to make this a place that feels like it's part of the community and so it hurts." "People obviously should be able to protest, but this is not the productive side of that." Others were more sympathetic to demonstrators. Sam Thomas, who was helping his friend clean up the glass from the shattered windows of his clothing and accessories boutique, said he understood why people were angry. The U.S. justice system is broken and needs to be fixed, Thomas told the AP. "I'm not saying this is the right way to fix it," he said of the violence. "The window isn't murdered. Nobody is going to have a funeral for the window. We can replace it." The rock band U2 canceled its Saturday concert in the city, saying in a statement that police were not in a position to provide the usual protection for the audience. "In light of this information, we cannot in good conscience risk our fans’ safety by proceeding with tonight’s concert," the band said in a statement. The St. Louis Symphony announced it was canceling "Harry Potter and the Chamber of Secrets — In Concert" to be held Saturday. And Ed Sheeran's concert at the Scottrade Center on Sunday was also called off, organizers said. Lyda Krewson, the city’s mayor, called the decisions to cancel the concerts "disappointing" but added "the issues being protested are real impediments to the success of our city." Saturday's unrest followed similar violence Friday when police said they were pelted with rocks and bricks. "Agitators" descended on mayor Krewson's home, throwing rocks and breaking windows, police said. Police used tear gas to disperse the crowd. Stockley, the acquitted former officer, said he saw 24-year-old Anthony Lamar Smith holding a gun and felt he was in imminent danger when he opened fire. Prosecutors said the officer planted a gun in Smith's car after the shooting. Phil Helsel reported from Los Angeles. Kurt Chirbas reported from New York. Max Burman reported from London.